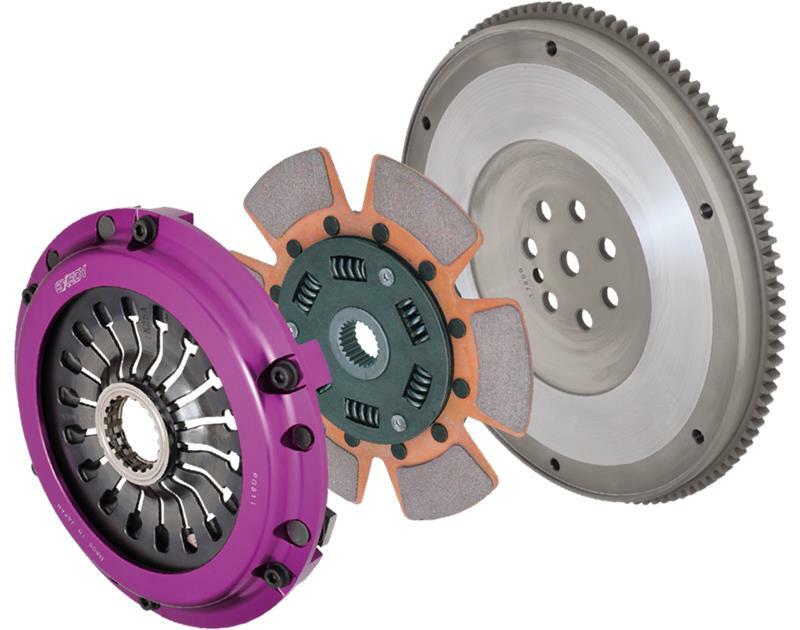 The EXEDY Hyper Single Series clutch is engineered to optimize the performance of cars that are moderately modified, but do not require the clutch capacity of a multi-plate clutch. 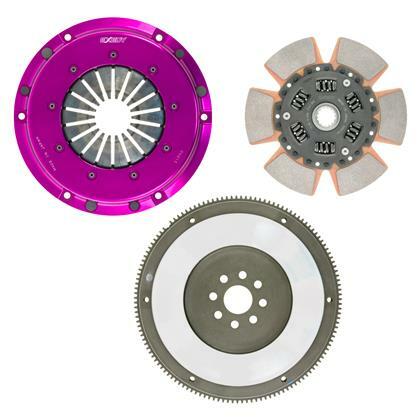 Similar to our multi-plate clutches, it has a purple anodized, forged aluminum cover. The aluminum cover is stiffer than a stamped cover and therefore allows a higher lever ratio to maintain the pedal efforts at a reasonable level. There is no clamp load deflection as found in a pressed metal type cover. Additionally, the pressure plate features a series of turbine-like, air flow enhancing vanes that keep the clutch cooler under extreme operating conditions to improve wear life. All Hyper Single clutches come with a chromoly steel flywheel and are normally supplied with a 6-puck cerametallic facing and a spring center damper disc assembly. However, on select vehicles, the new VF (Various Friction) disc may be offered. The chromoly flywheel is lighter than OEM for improved engine response, and a lighter overall assembly. The disc is generally smaller and thinner than the OEM disc making for lower inertia and therefore quicker, easier shifting and less wear and tear on the transmission synchros. The higher clamp load and cerametallic friction facings give approximately twice the holding torque of the OEM clutch and higher than other single disc clutches. High friction coefficient, low wear, and a special heat resistant material [T5001] has been applied to enable the clutch size to be reduced which in turn lowers mass inertia and improves shift responses for faster gear changes particularly in racing applications. Durability is improved with the use of a stronger, smaller damper disc, designed especially for the Hyper Single clutch. The VF enables the driver to operate the clutch through an easy-to-feel half engagement thanks to the Ultra Fiber friction material all while having a high heat dissipation and torque capacity due to the integrated metal facing. Furthermore, pedal effort has been drastically reduced and improved by the re-engineering and re-designing of the engagement point with newly developed cushioning plates. All EXEDY Racing Hyper Single Series Clutch Kits carry SFI 1.1 Certification. Which means, when you buy these products, you can be confident they are certified for use in competitive motorsports.